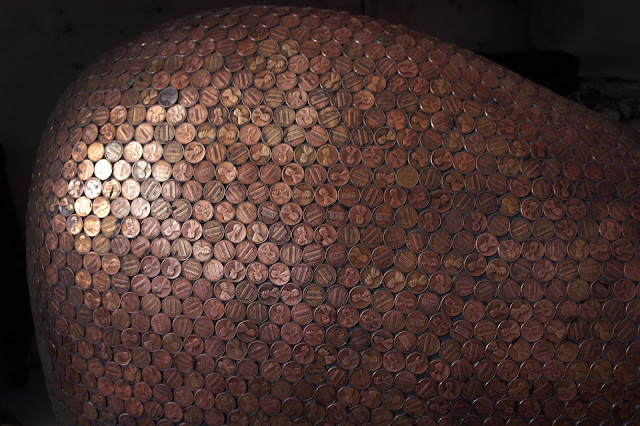 If you've ever been faced with the question of what to do with 15 thousand pennies, I seem to have found an answer. 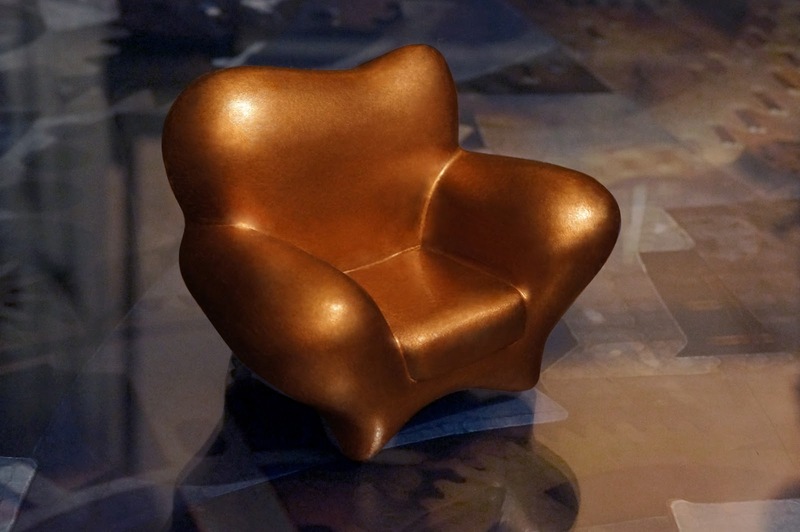 The Penny Throne started life as a model rendered in Super Sculpty. 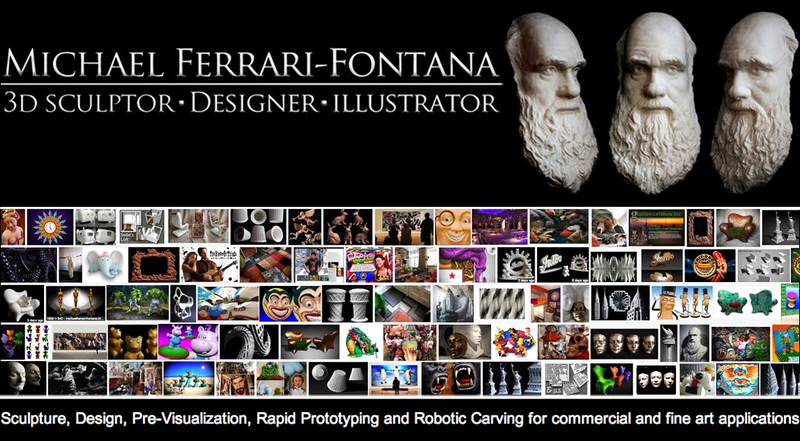 I had never used this material before and would only use it once again. It's a polymer clay that hardens when it's baked and is sort of sandable. The main attraction of it is that you don't need to make a mold in order to have a hard, stable sculpt but, the ardor of finishing this material radically diminishes that advantage. Being pleased with the plumpness and over all look of the 4 inch by 5 inch model, I set about the carving of the 4 foot by 5 foot chair. I had originally carved the chair as an experiment. 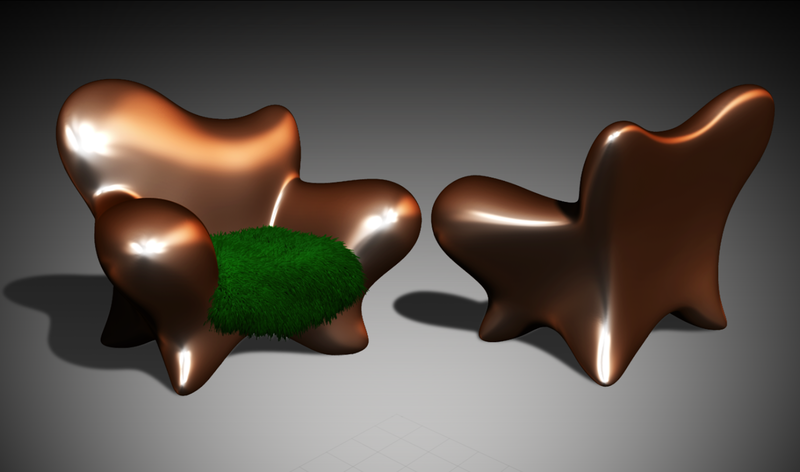 The design was initially conceived as a love seat but, the space that it was intended for wouldn't accommodate a 7 foot long stretched version of it. When the carving was completed and hard coated with a urethane resin, It was painted to look like malachite with a red velvet cushion. The problem was that I didn’t have the time to have the cushion made and, the chair was scheduled to appear in an exhibit that following weekend. My solution was to carve and hard coat a cushion shape and wrap it in velvet. It looked great, velvety and inviting but, it was in fact, as hard as a fire hydrant. At one point it was my turn to mind the gallery. I sat at the far end of the exhibit space and watched one person after the other throw themselves into this illusion of comfy, cushiness with candid abandon, expecting to be warmly absorbed by the chair. One by one, I witnessed the repeated birth of broken asses. 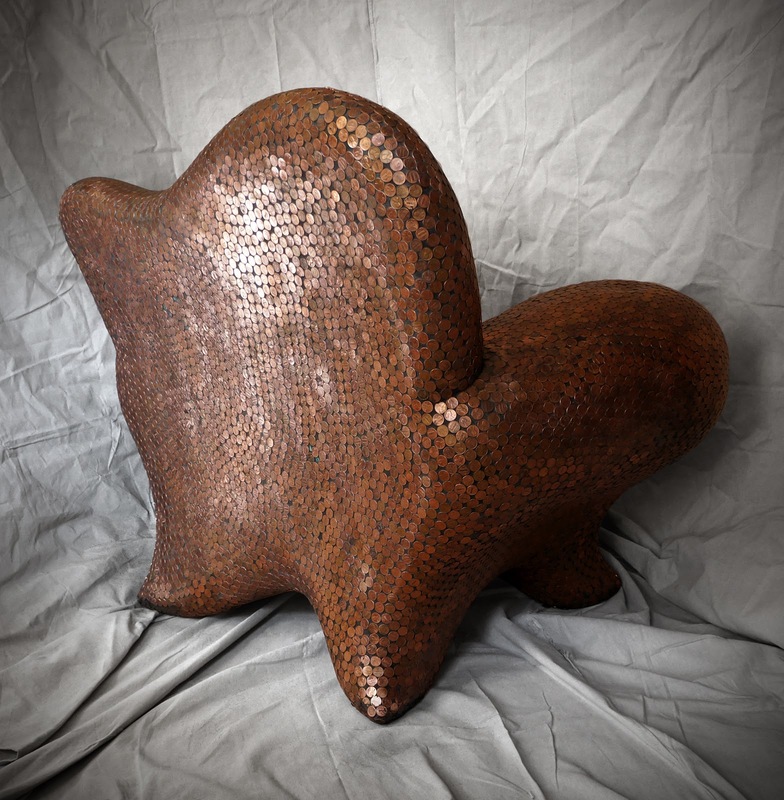 Now that the chair has a real cushion, coccyx bones are more safely cossetted from being cracked. As for the pennies, I felt that the chair needed a make over. I’ve always been a big fan of Tom Otterness’s sculptures. So many of them have used pennies as their recurrent theme. His "Real World" is a penny Magnum opus that can be seen at the Hudson River Park in lower Manhattan. There is also more than a modicum of Macy's Balloon design about this form, making the penny a perfect medium for the visual pun of fiscal inflation. There were other influences including Joan Miro's Moon bird and Johnny Swing who's coined furniture creations are truly magnificent. The penny is so many things to almost everyone. It's our smallest standard of currency, so seemingly insignificant that it's abandonment has been under serious consideration, yet it's the primary binary component in more monies than not. As it turned out, it’s a very dramatic way to cover a piece of furniture. When it darkens I simply wire wheel it with a power drill and it's bright and shiny all over again. Just like a penny, shiny and new. What I’d really like to do is mold and cast this in copper and photo chronicle it becoming green. The seating area would be covered in a cultivated moss. As an outdoor piece, I see it as one of a series of four arranged in a circle. With streaming rivulets of verdigris patina. It would seem from so many angles to be unearthly yet, organic, alien but familiar and above and beyond all else, fun and inviting. Aside from the whimsy and dreaming of setting scenarios there was a practical side to doing this if you can believe it. Good fabric is not cheap. Leather would have been interesting, somewhere between base ball mitt and American Indian bison artifact but, the patterning and seaming would have been a nightmare and a half and, elaborate paint jobs are never simple. Both of those refinishing routes would prove too fragile. This is a chair that's seen a lot of use. The paint had already been damaged and repaired a few times. This time around I wanted something permanent and impervious. 15,000 pennies sounds like a big number especially when being pain stakingly applied individually to compound curvatures but, it's really just $150 and a case of adhesives. 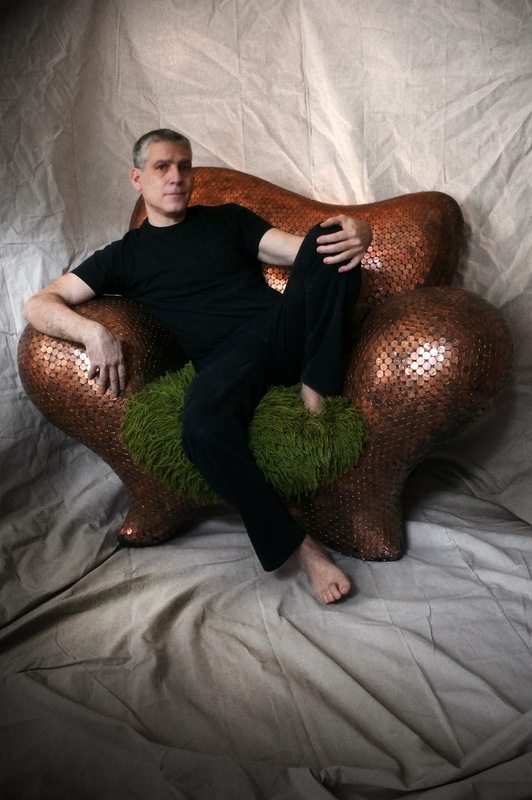 While it's true, the chair has gained considerable weight, my guess is that it may tip the scales around 160 lbs. or, roughly the weight of me. That may sound more portly than practical but a copper cast might weigh in closer to half a ton and require specialize equipment to move it around. 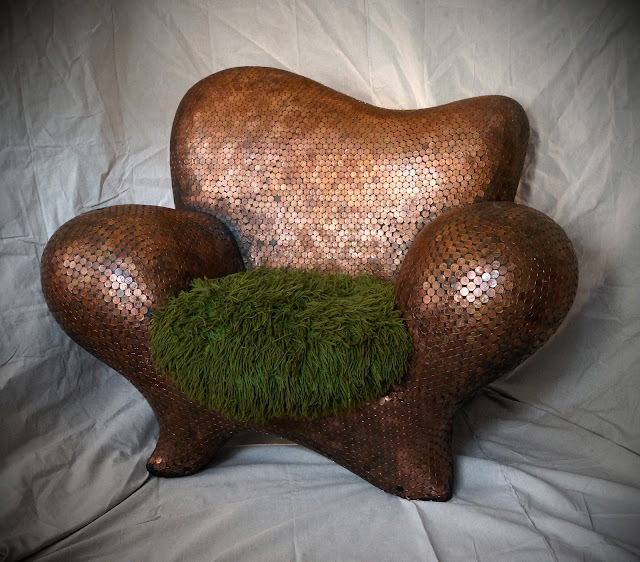 All said and done, the penny throne is a monumental sculpture that's practical enough to be lounged around on in the comfort of my home and no matter my economy, I can sit on this small fortune.